C-14 on AP 1200 mount with 100ED and C-5 subsidiary telescopes mounted to Homeyer scope-cradle assembly. The main telescopes are a Celestron C-14 Schmidt-Cassegrain and a Celestron C-11 Schmidt-Cassegrain. The C-14 is mounted on an Astro-Physics 1200GTO German equatorial mounting, the C-11 on an Astro-Physics 900GTO German equatorial mounting. 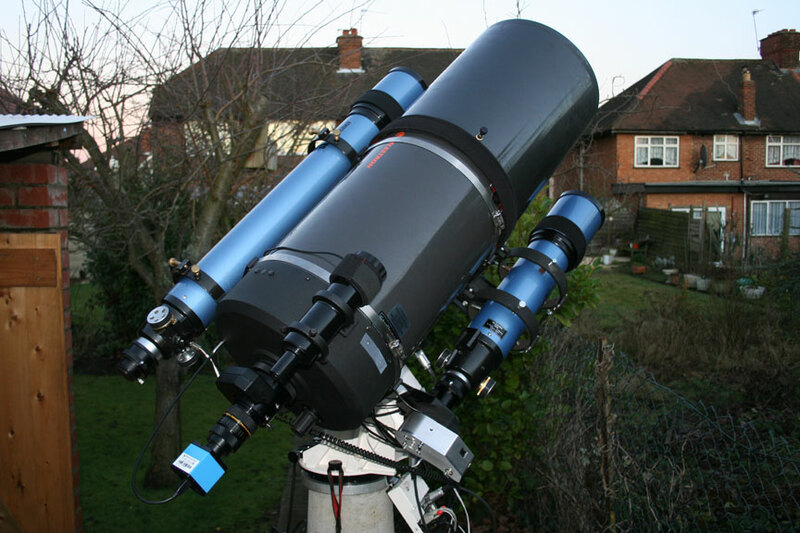 Having tried a wide variety of astronomical equipment the past, I have found the Celestron optical tubes and Astro-Physics mountings to be the most reliable and high-quality pieces of equipment in the mass-market amateur range, of those I have tried, and the only ones I would have no hesitation recommending. There are also smaller telescopes attached to each mounting. With this set-up, one of the telescopes, normally the C-11 or or an attached refractor, can be used for deep-sky or cometary imaging for a long period without any interruption for planetary imaging, which can be performed independently with the another telescope, normally the C-14. Alternatively, deep-sky imaging and visualy observation can be performed simultaneously, or one object can just be monitored on camera while another is being imaged. A wide range of subjects can be coped with by the range of telescope focal lengths available, shortest 389mm (312mm with a 0.8x focal reducer) on a 66mm refractor, longest 3912mm (extendible to more than 20m with a 5x Powemate) on the C-14. The C-11/100ED/80ED system. A Meade f6.3 focal reducer and DMK 21AF04.AS firewire camera are attached to the C11, and an Artemis 285 camera is attached to the 80ED. Both telescope triplets are attached to the mountings using Andy Homeyer Scope Cradles. These cradles I have found to be the optimum system for SCT mounting. They are extremely well-machined, accurate, and rigid, and allow easy removal of the telescopes, effective balancing, and rigid attachment of subsidiary telescopes. With the AP mountings, they allow for extremely accurate, repeatable GOTO slewing. The C-14 is mounted permanently with a Celestron 100EDR OTA (100mm f9 ED refractor). A third telescope on the mount is attached using the Vixen dovetail and saddle system on the other side of the mount to balance the 100EDR. I can switch this telescope between a Celestron C-5, a Lunt LS60T hydrogen alpha telescope, a Skywatcher ED80 or a William Optics Zenithstar 66. The 100mm is mounted using (slightly modified) Losmandy tube rings bolted directly to the cradles, to the side of the main telescope. The third, switchable, telescope is attached using an ADM Vixen-type dovetail saddle, attached to a Losmandy dovetail bar which is bolted to the Homeyer cradle base plate at the front of the mount. The C-14 is mostly used for planetary imaging and visual observation.The C100EDR is mostly used visually, but can also act as a guidescope for the C-14 in cases where guided imaging is required and the radial guiding method will not work, as it can be un-aligned from the main scope using the guide rings. The C-5 is mostly used for white-light solar observation, in conjunction with a Thousand Oaks Type 2+ filter, the Lunt is used for hydrogen alpha solar observation and imaging, and the Skywatcher ED80 and William Optics Zenithstar 66 are mostly used for widefield imaging. These telescopes are almost always kept and used on the east side of the mount. The eastern horizon is not good from this location, so they mostly look southwest: the C-14 and C-5 are accurately collimated for that direction and the collimation rarely needs to be readjusted. A major strength of the Astro-Physics mounts, unlike many other GOTO mounts, is that they allow the telescopes to look to the same side of the mount as they are located (by the mechanism of advancing or delaying the meridian reversal on the handset), so that normalisation can be completely avoided. This also helps preserve the collimation. The AP 1200 mount has been modified to the extent that it has had the shorter 14.5 inch counterweight shaft substituted, which makes for more room in the 2.3m square shed. The balance using this shaft is achieved in part using a large mild steel counterweight made by Dave Tyler. In addition, the GTO control box has been shifted away from Astro-Physics’ standard position on the polar axis to a safer position below the mount base (not shown here). 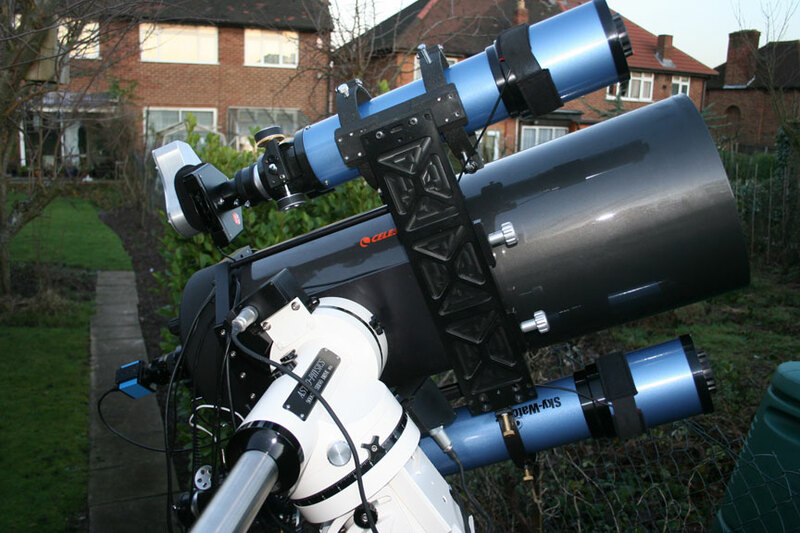 The C-11 is mounted with a Skywatcher 100mm f9 ED refractor, mounted in adjustable rings bolted to a steel bar bolted to the cradles. An 8″ Robin Casadydovetail saddle is bolted to the front of the Homeyer cradle base plate, and this takes a Losmandy dovetail bar to the end of which is attached a saddle arrangement for a Vixen dovetail bar. This can carry any of the small telescopes referred to above (C-5, ED80, ZS66 or Lunt LS60), as they have all been fitted with a compatible bar, or it can just carry a counterweight to balance the the whole system properly. The reason for the system with the Robin Casidy dovetail saddle is that it allows the counterwighting “arm” on the mount to be collapsed into the mount for stowage. The run-off shed in which this system resides is of limited height and cannot close unless the Losmandy dovetail bar is slid along the Robin Casidy saddle so the counterweight is brought close to the C-11 OTA. It is easily slid out again for use. Telescopes on this mount are not often used visually. Any of them can be used for either long-exposure or fast-frame rate (“webcam”) imaging under control from the computers in the warm shed, or for DSLR imaging. They are used on whichever side of the mount is needed. The AP 900 mount has been slightly modified, to the extent that the GTO control box has been removed from the polar axis mounting and affixed to the telescope pier (the cables were also extended to allow this). This removes the chance of the refractor assemblies snagging the control box wiring, particularly when the mount is “normalised” (reversed east-west). 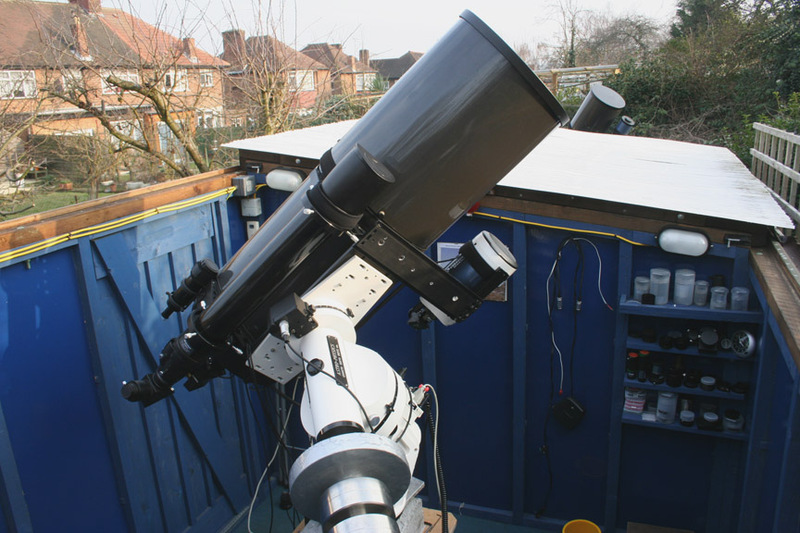 The AP 900 mount is equipped with the 18″ (long) counterweight shaft from the AP 1200, as there is no shortage of space around this set-up as it is sheltered by a run-off shed. Both the C-14 and C-11 are equipped with Astrozap rigid aluminium dewshields and dewshield caps. I can thoroughly recommend these as a dewing solution for permanently-mounted SCTs, in preference to the thoroughly useless flexible dewshields offered by Celestron and other manufacturers. All the telescopes and finders are supplied in addition with Dew-Not dew heater bands, and I also use one of these to warm the nosepiece of the Artemis 285 CCD camera. Both the C-11 and C-14 have Meade motorised Crayford micro-focusers. The C-11 also has coarse electric focusing provided by a JMI motofocus unit. Coarse focusing of the C-14 has to be done by hand. The refractors all have motor focus adaptations either from JMI or Switched Systems. Both mountings are bolted to aluminium cap-plates on concrete piers with concrete foundations going 3-4 feet into the ground, and reinforced with iron pipes driven 1-2 feet further into the London clay subsoil. The pier for the AP1200/C-14 is about 16 inches diameter at the base and 14 inches diameter at the top. The pier for the AP 900/C-11 is about 12 inches diameter. Significant vibration problems are experienced from the traffic on Stag Lane, over 50m away, despite the apparent solidity of these constructions. The observatory has mains power, and most equipment runs off 13.8V, which is supplied from two 10A and one 4A power supplies. There are some exceptions to this, such as the USB hubs and CCD Peltier cooler, which have other power supplies.